As some of you might remember I started a new series here on the blog a while ago. It is called ‘Creative Q&A’ and I decided to focus on ceramicists that make beautiful every day use objects and tableware. Ceramicists whose objects I admire and that you see in use often here on the blog. Last time we were invited to peep into the little cabin of Elin Lannsjö where she often comes to work and where I got to photograph her and her ceramics. 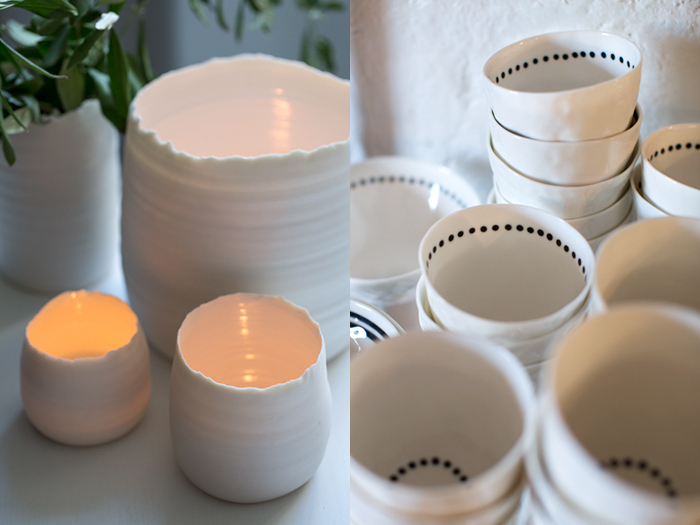 Today you’ll get to meet Kajsa Cramér – a lovely person and ceramicist based out of Billdal, a bit south from Gothenburg on the west coast of Sweden. 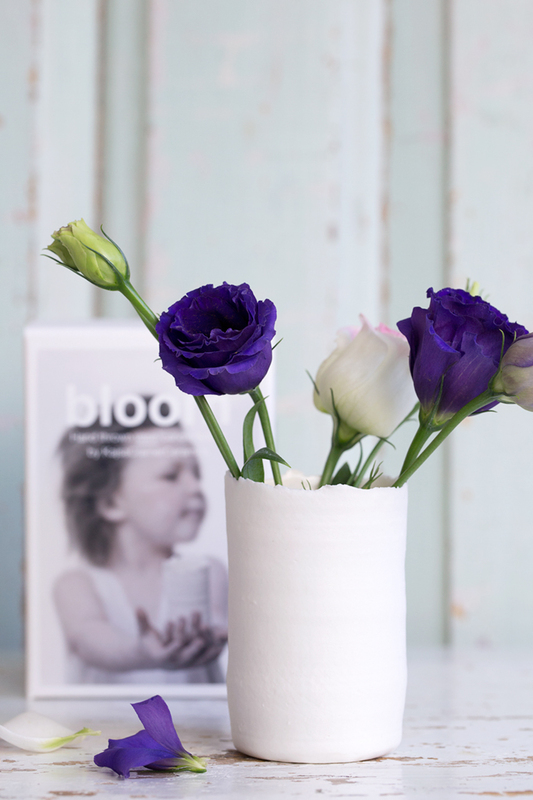 Kajsa creates unique, clean and amazingly beautiful objects with a timeless, simple yet elegant scandinavian touch. She works mostly with white porcelain clay (kaolin) and she says she loves its clean and almost transparent look after burning. That’s also why she doesn’t use much color in her work. She wants the clay to play the main role and to really ‘shine’. 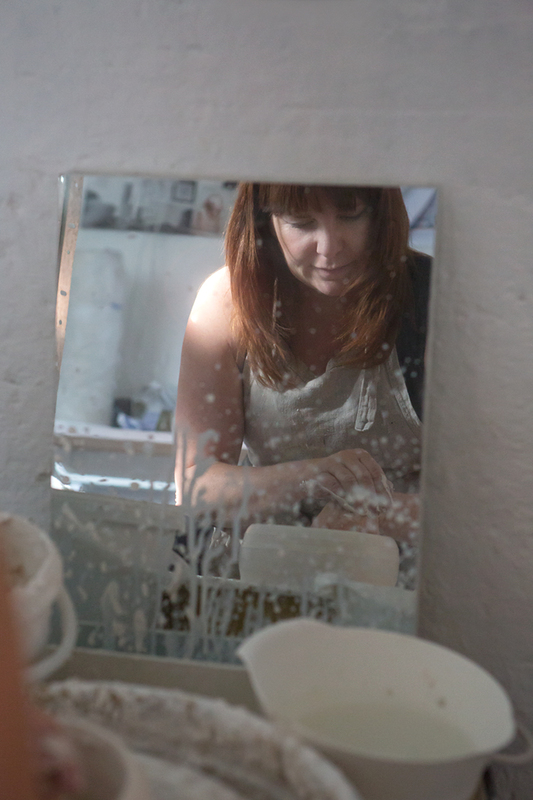 Kajsa was kind enough to answer a few questions – and to let me have a look inside her little studio where she makes most of her ceramics. I have been doing ceramics as a hobby for about 15 years, and four years ago I decided to make it my profession. 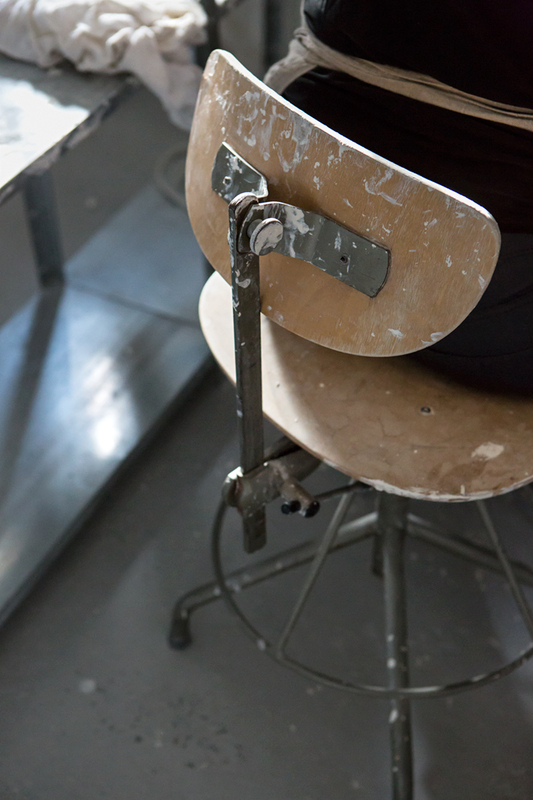 Along with my former job as an interior stylist I took several different courses, and in 2006 I started my education focusing solely on ceramics at Löftadalens Folkhögskola. That was when I started dreaming about making ceramics my profession. I never returned to my former job after we had our third child in 2009, and from then on I have been following my dream. I’ve always had creative jobs such as florist, stylist, interior stylist etc. 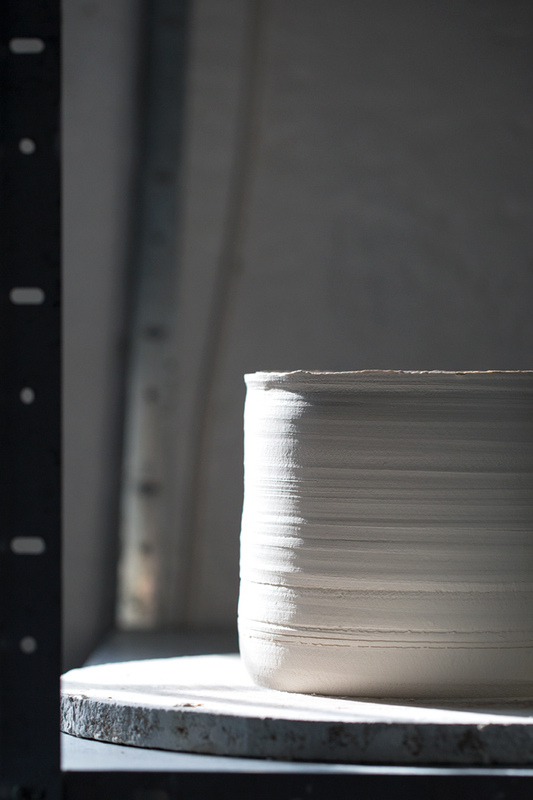 I was drawn to ceramics because of the challenge it brings… and there is so much to try in terms of clay. I knew I would never get bored working with clay. Working with clay also allows me to combine my former creative experiences with clay as I create vases, candle holders and tableware for decorative use. At the moment ceramics is my thing, but I’ll probably try other ways of expressing myself creatively in the future. But I’ll never let go completely of clay. The clay in itself is my biggest inspiration. I love all of its states – wet, bone-dry, burned and finished. And I try to show off all of its states in my objects, which is why I love to combine shiny and matte finishes and that’s also why I hardly use any color in my glazes. Nature also inspires me a lot (Have you heard that one before? she says and laughs.) As I walk my dog in the woods and near the ocean I study shapes, shades and surfaces and the changes in nature with the seasons. But of course I’m also inspired by interior magazines, blogs, shops and travels. Inspiration can also be found in a simple sheet of paper, a painting, a photograph or a wall color. I guess I’m always on the lookout and inspiration is a complex thing that you cannot always explain. When I create something new I have a basic idea of what I want to do. But my philosophy is also that it is up to the owner of my objects what to use it for. A lantern can be used as a vase, a bowl or as a pot for a plant. The mug becomes a bowl, the espresso cup turns into a candle holder etc. I simply want the design of my objects to inspire the owner’s creativity. 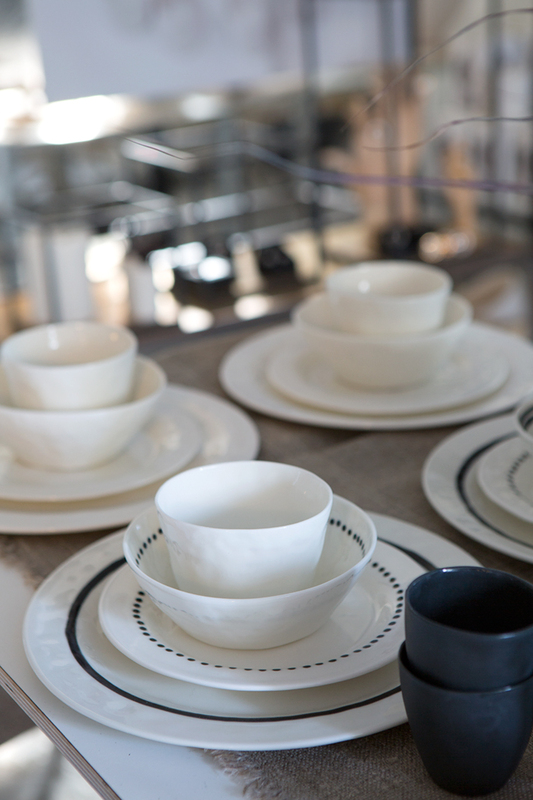 At the moment I am very fond of my new tableware ‘Black’. I love that the clay is unfinished and matte in combination with an edge dipped in glaze. I really like it when the clay and its natural state is shown off without the disturbance of painted patterns. I also love the candle holder and I use it for almost anything – pot, vase, pen holder etc. But I love it the most when used as a candle holder. When lit it becomes almost transparent and the throw lines become clearly visible. I also love that the outside is matte while the inside is shiny, which reflects the light beautifully. It shows that it has been made by hand. Perfectly imperfect. Kajsa has also been kind enough to share a small object of hers for a giveaway with one lucky reader. It is named ‘Straight small bloom’ (pictured below). If you would like to win, simply leave a comment below. The giveaway will close on Sunday, October 26th. And please make sure to leave your name and contact email so I can get in touch with you. And you are welcome to join in regardless of where you live in the world! Åh, så fint alltsammans. Gillar dina intervjuer och små besök. Och så älskar jag Kajsa Cramers keramik och vill gärna vara med och försöka vinna den fina fina vasen. Åh, jag vill jättegärna vinna denna underbara lilla skapelse. So So beautiful, what a gift! And I just love the idea that one thing can have so many uses. Amazing! Jag älskar Kajsa Cramér!! hennes keramik är helt fantastiskt och den där söta lilla saken skulle passa så fint hemma hos mig. Håller alla tummar och tår! Jag älskar renheten i Kajsas verk. Den tunna, till synes sköra vasen är ljuvlig!Den matta ytan gör helheten. Som student i vackra Jämtland, med fjäll och grönska som närmsta granne, vore det en fröjd att få plocka med naturen hem och förgylla den lilla studentlyan med en vas från min hemort Billdal. Jodå, jag är granne med den fina lilla verkstaden men aldrig fått råd till att unna mig en av hennes underbara kreationer! I love your work. 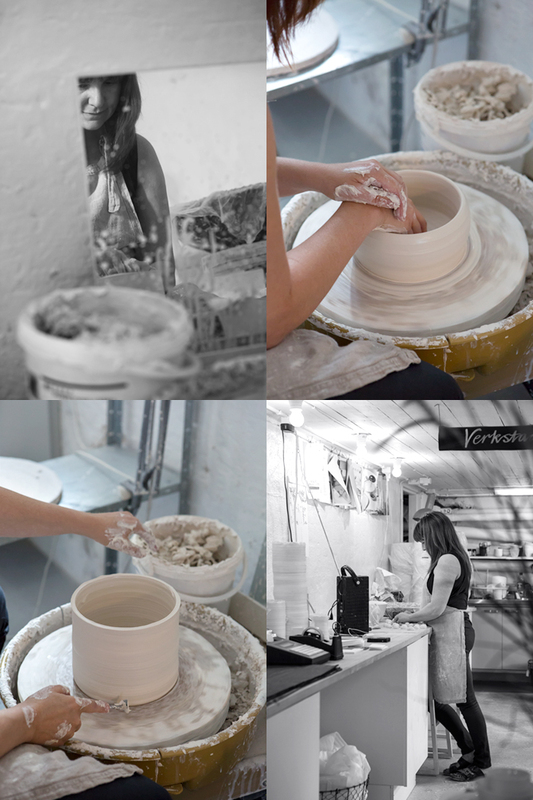 The white porcelain clay is my favourite, too – I’m so happy one of your teachers encouraged you to use it! I agree that “imperfectly perfect” is the way to go with ceramics, it really gives it that something special. Den vackra vasen skulle jag gärna använda och njuta av hemma hos mig. Very nice article and blog. It’s great to hear how Kajsa is following her dream…it shows in her work. The small piece is stunning in it’s delicate simplicity, and it would be a treasure! Vilket fint reportage och fina bilder som alltid. Vaser kan man aldrig ha för många och denna fina skulle jag bli så glad för. Håller tummarna. Jättefin keramik, jag är gärna med i utlottningen! What a breathtakingly beautiful photo essay, and thoroughly inspiring interview. I would love nothing more than to win that lovely ceramic piece for myself! Gud så läcker! Klart att jag vill vara med och försöka vinna den. Så läcker. Klart att jag vill försöka vinna. Åh vilken söt vas. Den vill jag gärna ställa på min byrå! Beautiful ceramics, each piece is unique, I would love to have one in my home! Din blogg är snygg, välskriven och välgjord! Keep up the great work!